Early 1970s. Photo by Martin McReynolds. 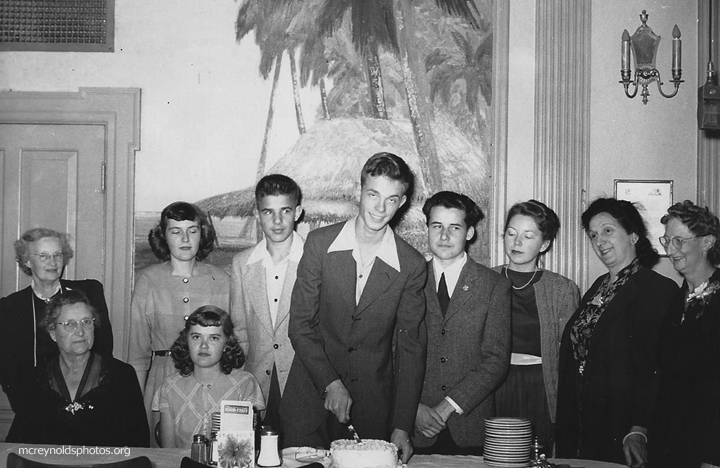 David, cutting cake, launched into activism with the Youth Temperance Council of which he was the Southern California Chapter President. His brother Martin is on his right. 1948. In San Francisco visiting his friend Alvin Ailey. Photo by Alvin Ailey. Circa 1952. 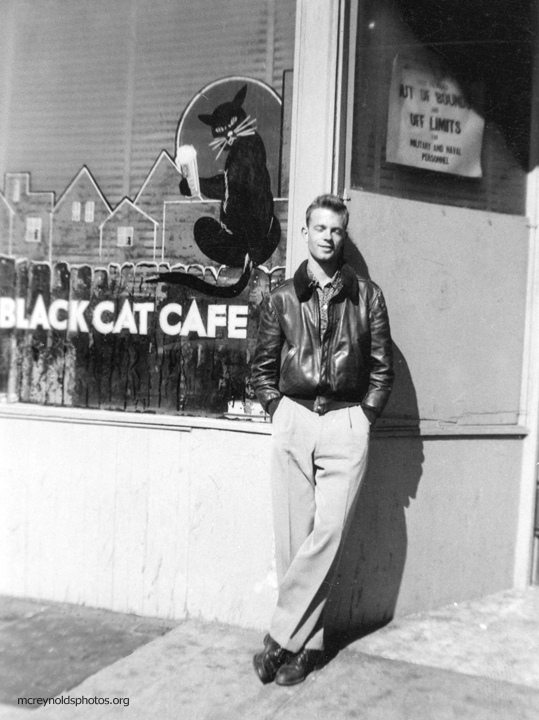 The Black Cat Cafe was a popular bohemian/gay hangout. 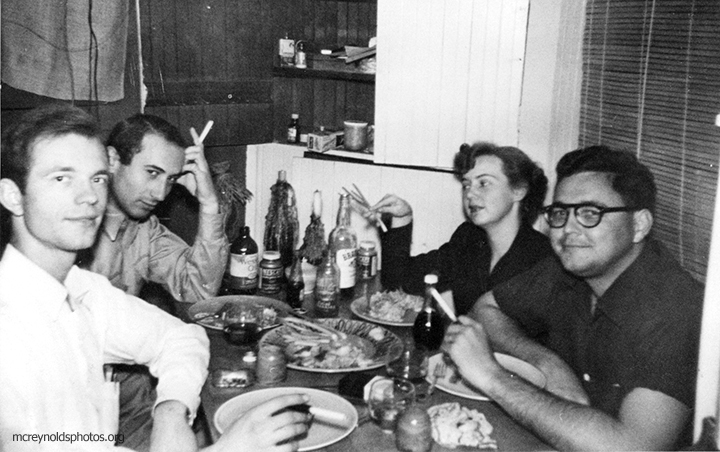 David, Harvey Berman, Maggie Phair, and Vern Davidson, 1950s. Reunion of old friends, April 1995: Maggie Phair, Harvey Berman, David, Vern Davidson. 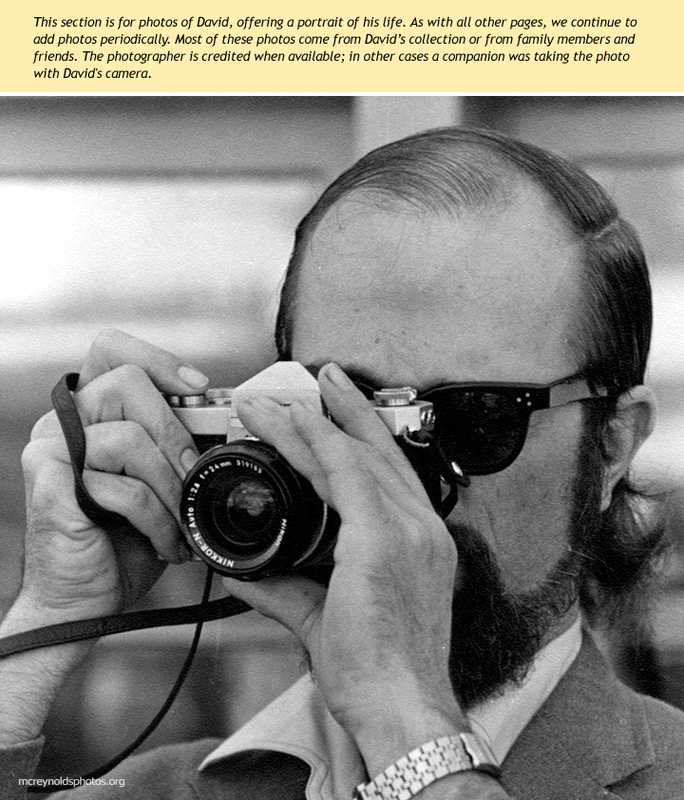 Recently graduated from UCLA, David was arrested for refusing the Korean War draft. 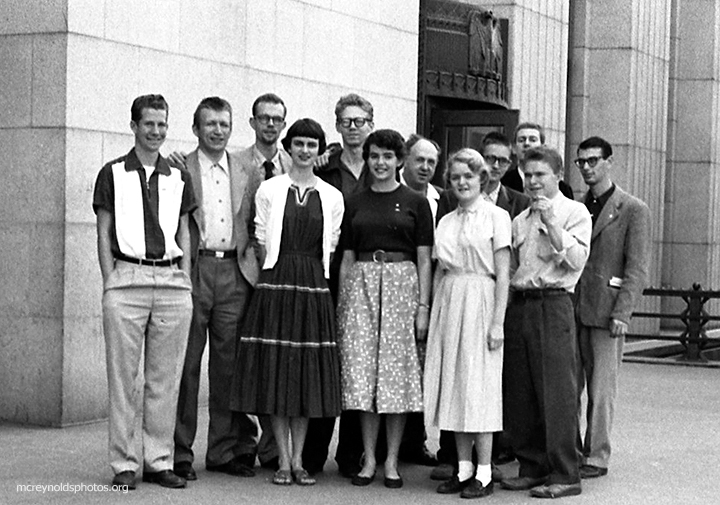 His case was dismissed on a technicality in March 1955 in Los Angeles, and he met his “Pasadena group” supporters outside the court. Men's row, left to right: Rocky Spoelstra, Harry Sittonen, David, Rex Backus, Charles Curtis, Doug Pomeroy, Frank Hamilton (partly hidden), Tom Klopfer. Front: Leora Rundstrom, Kate Collins, Kelly Pomeroy, Hank Maiden. 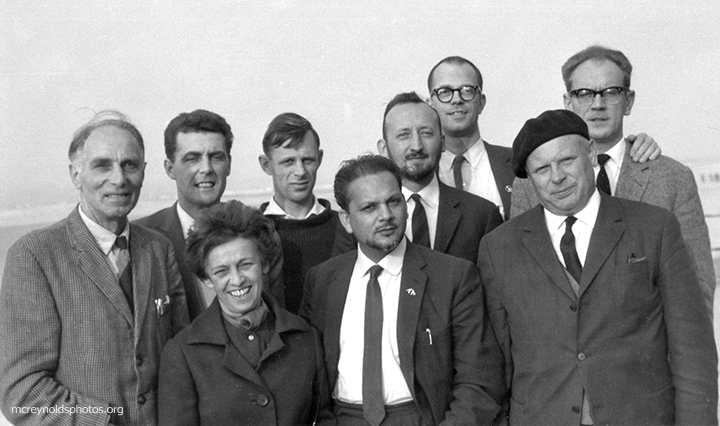 At a 1964 War Resisters’ International meeting in Ostend, Belgium, between representatives of WRI and the World Peace Council. Left to right: Harold Bing, WRI; rep from World Peace Council; Madame Rosy Holender, General Secretary of the Belgium Union for the Defence of Peace; Michael Randle, Devi Presad, Jan Van Lierde, David McReynolds all representing WRI; no ID; Stanislaw Trepczysnki, Member of the Presidential Committee of the Polish Peace Committee. War Resisters League files. With his mother, Elizabeth. East Village, early 1960s. 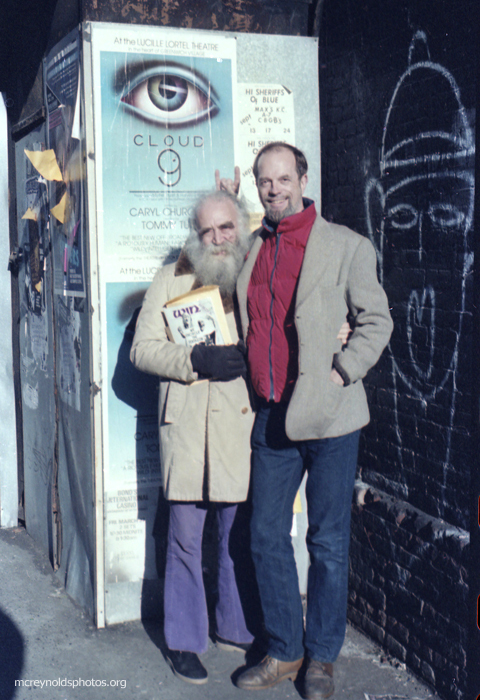 David and Igal Roodenko. East Village, 1970s. 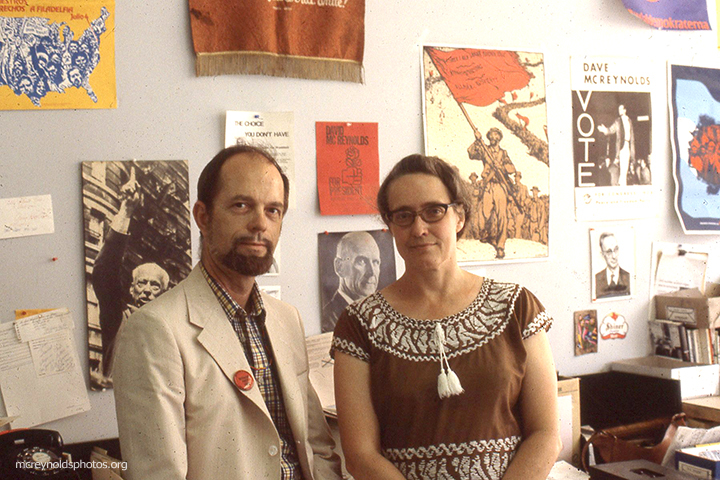 Presidential candidate for the Socialist Party with his Vice Presidential running mate Sr. Diane Drufenbrock, 1980. Photo by Steve Rossignol. 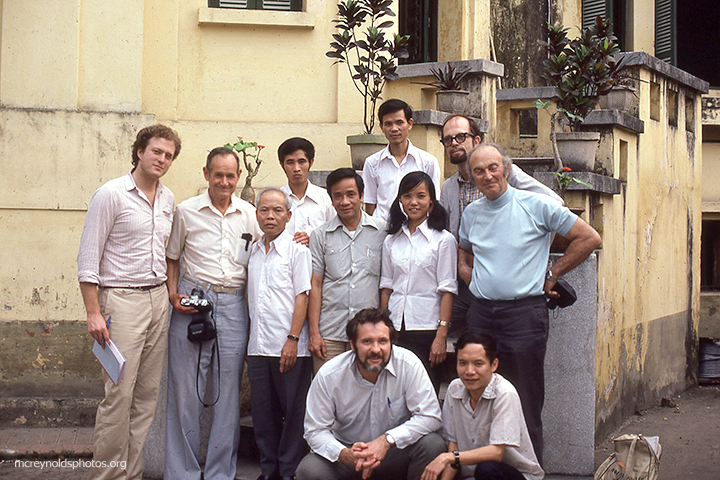 In Hanoi on his third trip to Vietnam with a tour led by Don Luce, front center. 1981.